Patrick Baffa will compete in the World Armwrestling League finals on June 29. BAYSIDE — Crouching over the table, his fingers intertwined in his competitor’s hand, Patrick Baffa is struggling to knock out his opponent during a training session at Little Bay Park. His right arm is wrapped around a bar at the end of the table. Every muscle in his body is straining as he tries to overtake Steve Black, a longtime competitor and training partner, with his left arm. After a few seconds, his arm falls to the table. He smiles. "We have no ego here," he says. 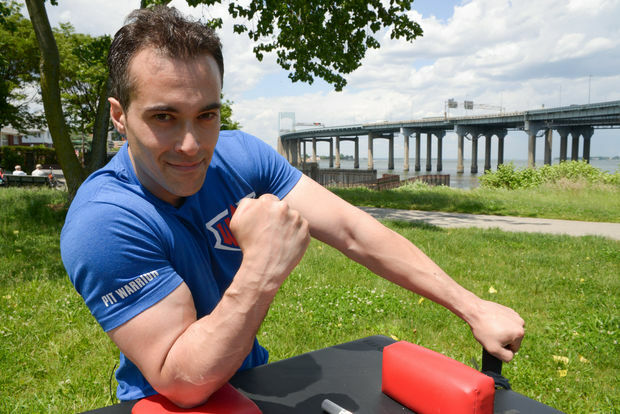 Every loss in training helps him better prepare for the World Armwrestling League finals on June 29 in Las Vegas, where Baffa — who works as a plumber by day — will be the only New York City athlete to compete. He first started arm-wrestling against his dad, who introduced him to multiple sports, he said. As a teenager, he discovered he had a talent for it. At Bayside High School, members of the football team would line up in the cafeteria to challenge him to a match. “I would pretty much destroy them,” Baffa, 33, said. He started competing in tournaments, including one on top of the World Trade Center in 2000, winning medals across the tri-state area. “Any tournament we went to, we would just shred it,” his best friend and sometime rival, Edwin Safarian, 34, said. The two met in high school, where Safarian had been the reigning king of the cafeteria arm-wrestlers before Baffa came along. “I had never lost an arm wrestling match in my whole life until the moment I met Pat,” he said. The two started entering tournaments and beating adults across the tri-state. After a few years, they realized the limits of arm wrestling as an underground sport. Arm wrestling can be a “rich man’s hobby," Black said. “You get to the top of this dream you’re trying to build, but the money isn’t there,” he said, calling himself a “closet athlete” because of the intense training that goes into it — without the same level of respect as other sports. But in recent years, there’s been a resurgence in arm-wrestling, particularly with the creation of the Chicago-based World Arm Wrestling League, Baffa said. In 2014, both he and Black appeared on the reality show “Game of Arms,” which aired on AMC. Although it only lasted one season, it “spurred me to get back into the sport,” Baffa said. He started training again — working on his grip, doing weighted pull-ups with 90 to 130 lb weights, and getting lots of "table time" with other wrestlers. It's there he can work on strategy and technique, right hooks and pulls, that prepare him better than weight training. He cut his weight down to 165 lbs, where he’s currently ranked 24th in the WAL. He competed in tournaments around the country to qualify for the finals. The league has grown every year, which is promising to him, he said. He’ll compete this year with his left arm, despite training most of his life with his right. While both arms are equally strong, there are different skills and techniques for each arm, he said. Baffa can’t explain how or why, but his left arm started performing better in matches. “This is absurd,” he thought, feeling that the universe was speaking to him. But it got him to Las Vegas. Now his arm-wrestling crew in New York is rooting for him to win it all — and for the sport to keep growing. The ultimate dream for many is for arm-wrestling to be an Olympic sport. Baffa would love if younger athletes could have more incentives to take up the sport — even college scholarships for it. “[Arm-wrestling] has a very barroom mentality, but there’s a lot of physics involved here, and it should be more respected than it is,” he said. For now, he’s feeling good about his chances in the finals. CORRECTION: An original version of this article stated that the WAL finals will air on ESPN 2. The finals will no longer air on the network.